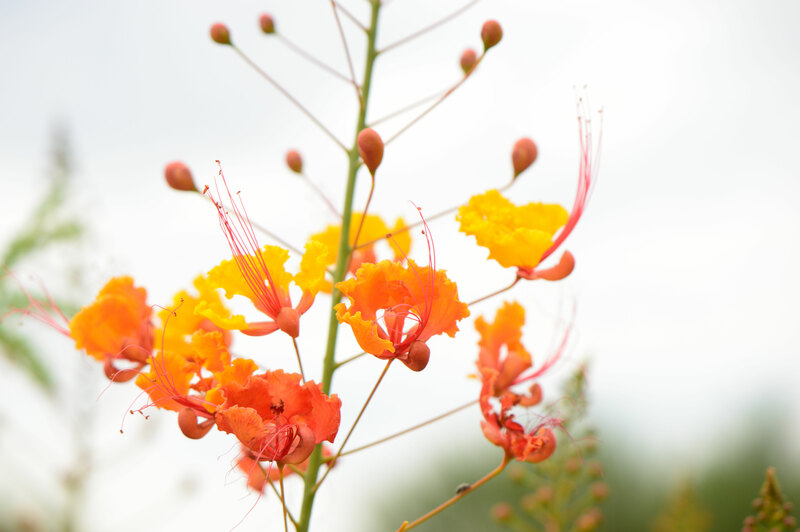 One of the distinctive traits of summer in the Sonoran Desert is that the season naturally divides itself into two parts. Which is as it should be, perhaps, given that summer is such an intense and long-lasting season. The two sections of summer could almost be distinguished as dry and wet, but that might be an exaggeration. Perhaps they should be termed Very Dry and Slightly Moist? The first is the Very Dry, extending roughly May and June. It overlaps the summer solstice, which means very intense sunlight at the time when humidity is lowest, often dropping into the single digits. Heat rises above 100 F, then above 110 F. For the last two summers, temperatures have reached 118 F before dropping back slightly, but it's the prolonged periods over 108 F that seem to do the most damage in the garden, just as in a cold winter garden, extended periods below freezing do more overall damage than a single sharp dip. Typically the region has already been rainless for many weeks when the temperatures begin to rise, so there is no natural soil moisture for plants to fall back on. This is the period when leaves turn from green to brown within hours and plants that were apparently adjusting to the heat suddenly collapse and die. As the so-called monsoon season enters, normally in early July, moisture begins to spread in from the Gulf of Mexico. Rain may be heavy or light, but if it comes, its arrival washes the air and soil and lowers temperatures for a few hours at any rate. When the heat returns it is more formidable with the rise in humidity, but it seldom returns quite to the levels of June. A good monsoon season, with its desert thunderstorms and humidity is welcomed by much of nature. This includes the birds, the toads, and unfortunately the mosquitoes. It's harder on the humans and livestock, but still those sudden cooler hours make summer bearable again. For the garden it is a godsend. The first part of summer is the time I layer mulch madly over everything, then hold my breath and just watch to see what will survive. As so many plants falter, a few of the summer bloomers come quietly into play, but it is not a lush season. 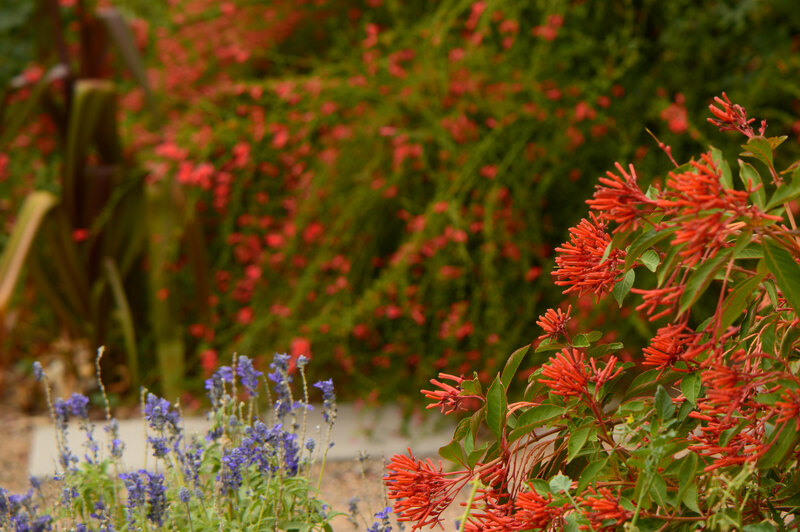 With the arrival of moisture, the summer garden has a chance to put on a more brilliant display. 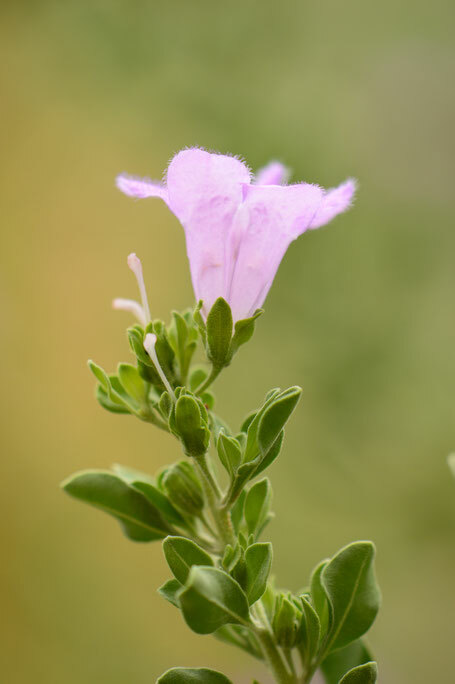 This is the time the tropicals call their own, though many will bloom earlier or later as well. And now, at the end of July, here is a look at what the monsoon season has done for the garden this year. So far it's been an unusually good one. Layers of yellow and red flowers dance above the lush green foliage of Caesalpinia pulcherrima. Lantana "Denver Red" is rambling to meet it. 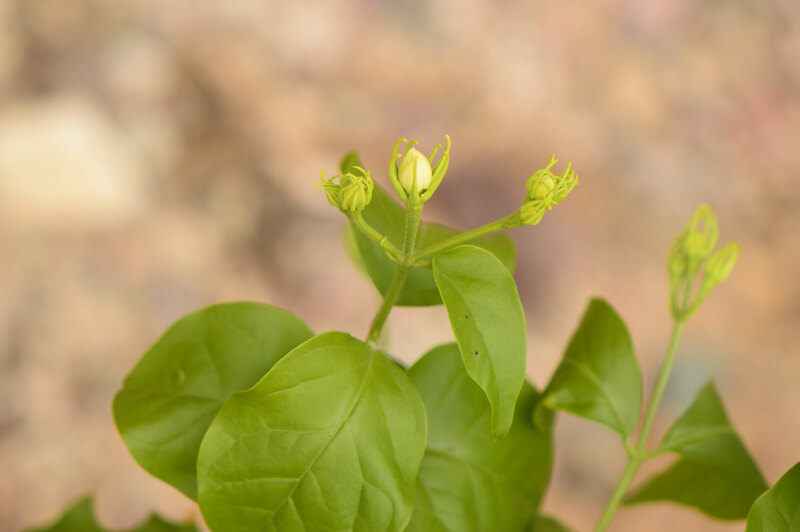 The quintessential flower of fugitive summer moisture: Leucophyllum frutescens blooms in response to humidity as well as rain. Cuphea ignea "Vermillionaire" has been in flower off and on for months, but it is blooming more heavily now than ever before. 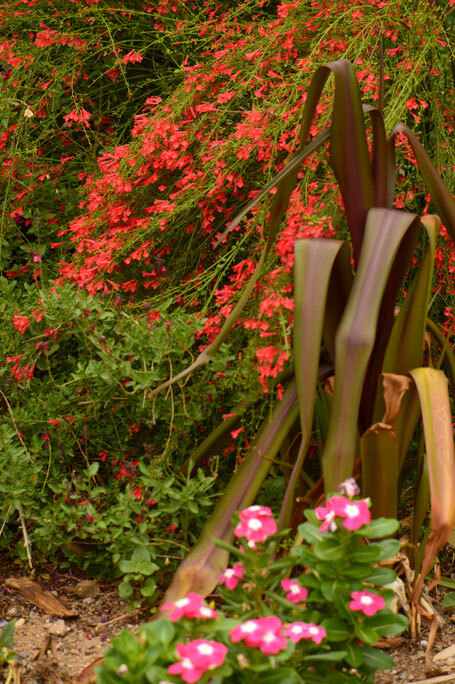 Russelia equisetiformis "Big Red" is a mass of bloom in the background (Catharanthus roseus in front, along with the bronze leaves of a Crinum). 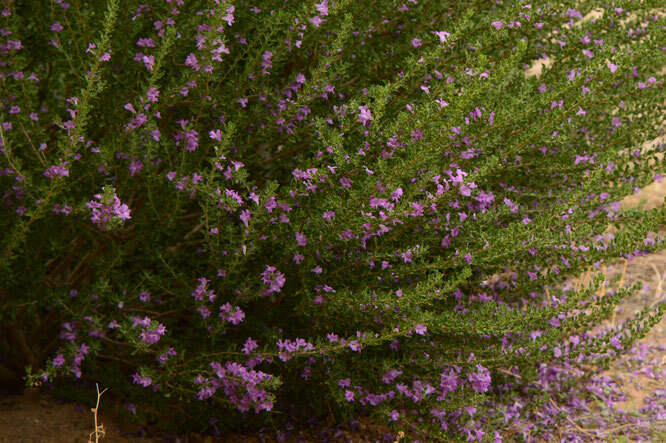 Russelia is never entirely out of bloom, but the flowers were very sparse only a couple of weeks ago. 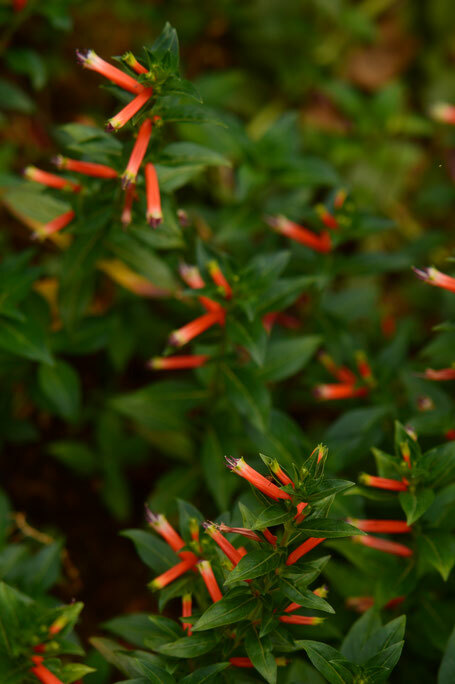 Hamelia patens, along with Salvia farinacea, against a backdrop of Russelia. 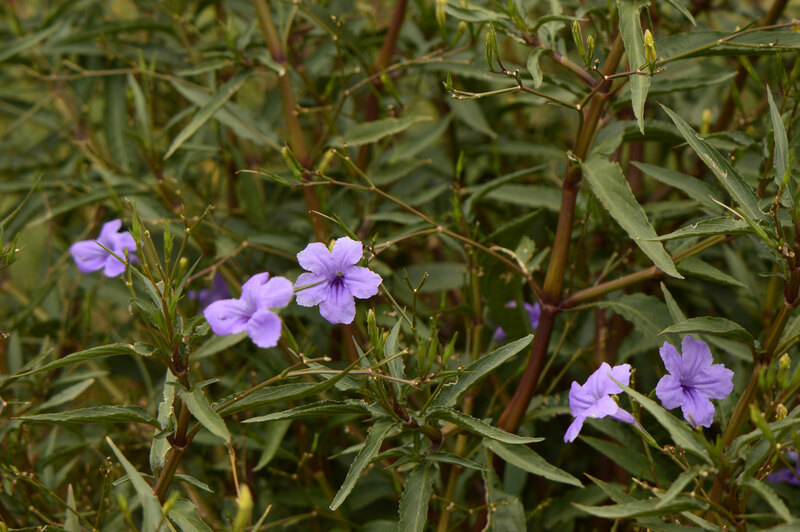 Ruellia brittoniana is in its element in this weather. Flowers bloom for one morning, then drop by the next day. 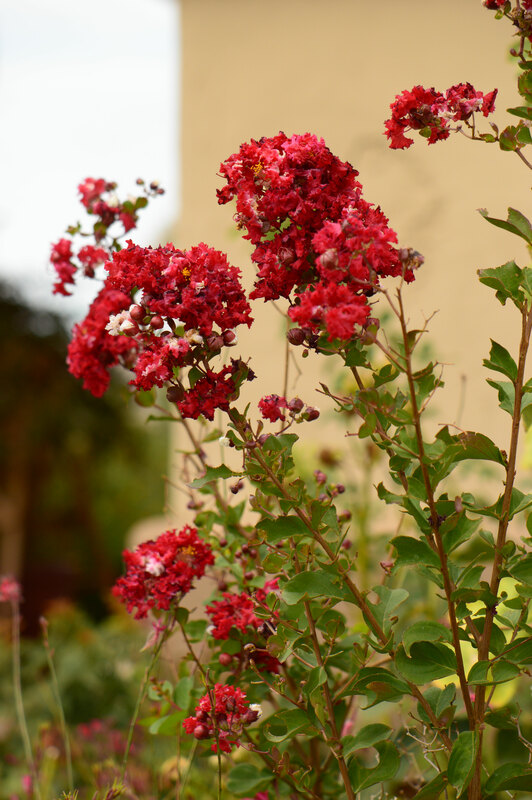 Another from the East Indian tropics, Lagerstroemia indica is an excellent performer in the heat but is much happier with some rain and humidity! The classic for summer color here (and I am told that many varieties have been developed here in Arizona) Catharanthus roseus is making itself at home, to the extent of seeding between pavers and out into the garden path. Finally, a more personal note. Over the past month or so it has become very likely that we will be moving, probably to New Mexico. While this holds some exciting possibilities, I've found it difficult to deal with the idea of leaving a half-finished garden. Hopefully everything will sort itself out as things go on! In the meantime, my blogging may continue to suffer a bit. I intend to carry on with the blog, but posts may become somewhat more random, and I'll probably not be consistent with regular memes. Thank you for the look at your garden at the end of July, I hope you get to enjoy the beautiful fruits of your labor for a bit longer. New Mexico? That sounds really exciting! Another state another garden... ;-) Your post today is so lovely Amy. 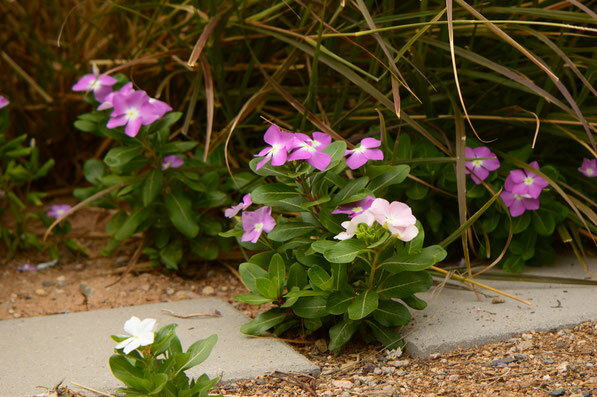 The oranges and reds are beautiful, and the Catharanthus looks like it is perfectly at home in your garden. Lovely photos too! Loree - Incredibly, the plan has just been called off (just as I finally posted about it, of course!! lol). We were headed to the Santa Fe area. I have always loved New Mexico, but frankly I am sooo relieved not to be leaving here. Now I get to properly enjoy helping the garden wake up from the summer doldrums! Sometimes I worry that all my bright reds must be a little shocking, especially en masse, but I do love the effect! Summer delights........... another marvelous post. A change in a change in plans...... which may give you fresh eyes to view and rediscover your old surroundings. Amy, Your garden looks beautiful! 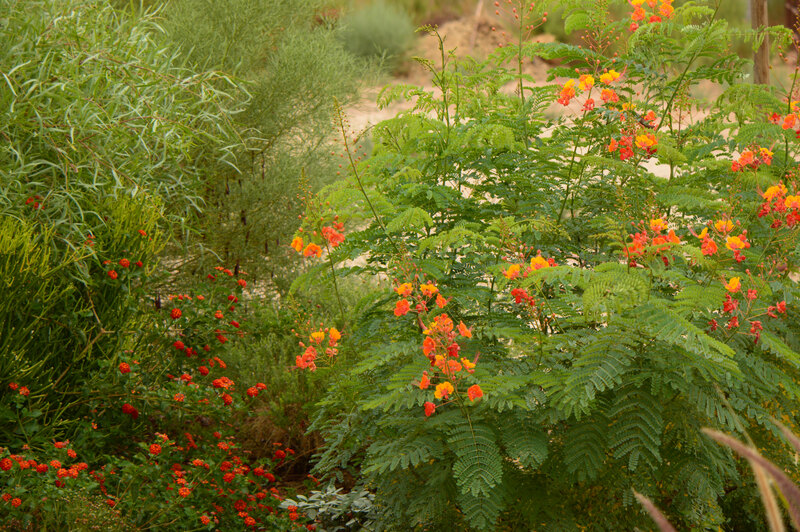 those borders are so colorful and exuberant, it's easy to forget that your garden is in the desert, it's an oasis of lushness. I never have to deal with drought here for it rains a lot but summers are long and hot with temps that can reach 113 F and sometimes even more, the winters are mild , short and generally frost free (rarely under 41 F). This winter has so far been warm and very wet some plants have not even tried to go dormant. Wish you a happy August to you and your lovely garden! It never ceases to amaze me how plants, animals and even humans cope with such different weather conditions. I think that's exactly true, Derek! In fact, I'm reassessing the whole yard now ;-) Honestly, it's a relief to know I can stay here and continue my ongoing projects. Marcelo - Many thanks for the kind comments! :) I think I would find your gardening conditions at least as challenging as these - very difficult to do 113 F with humidity! Many of my plants also refuse to go dormant in winter, which is a good season here though colder than yours (sometimes dropping just to freezing temperatures). 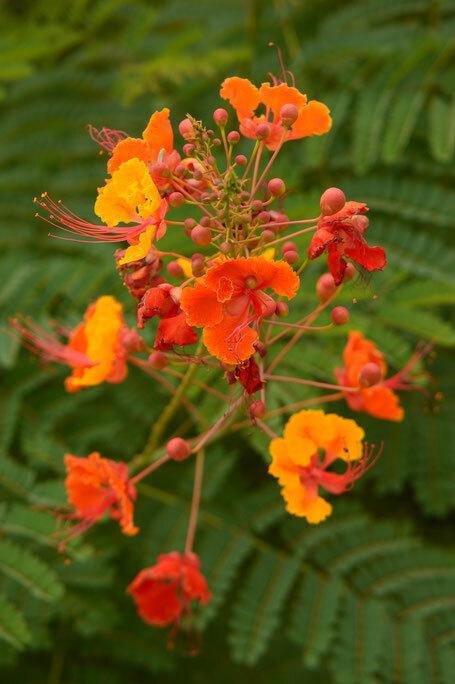 And curiously, my best summer plants are often from the tropical Americas because they will continue blooming in the heat: Russelia, Caesalpinia, Hamelia, and others. Native desert plants often go a little dormant in summer, so I am grateful for the tropicals! They keep my garden alive in the hottest months! Very, very accurate rendition of the southwest monsoon season! Took me a decade or more to get it. Hmmm, a possible move to NM...now no move...at least you can finish your garden and watch it grow in much more.